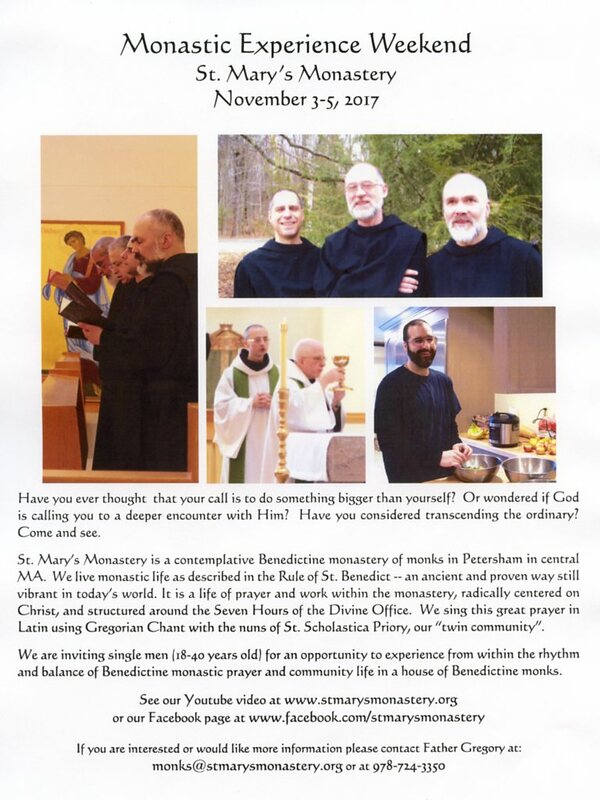 Here is notification for this year’s weekend at St Mary’s Monastery in Petersham, Massachusetts. I was pleasantly surprised at how positive the response was last year, and am happy to give notification of the event again. A poster with the details is below, followed by a video of Fr Dunstan describing the event. It has one of the best opening lines I have seen in a while: “This is a low quality video about a high quality idea.” And it is indeed a high quality idea! I suggest that this is worth watching even if you are sure you’re not going to the November event and will never get to Petersham. It is a wonderfully clear explanation of what a religious vocation is and why it is worth pursuing.